Hymn #59 is so much fun. There’s a dancing spirit about it right from the get-go. Those falling eighth-notes with the rapid rising bass in the first bar get us cookin’. The the swirling eighths at the end of the line followed by more running eighths int he melody get us burning nice and hot, ready to burst out in the chorus. By the time we get to the 2nd verse and we start pleading for Him to come and “cleanse the earth by fire,” we know for sure what’s going on. It’s a ritual Mormon fire dance! Forget square dancing, we’re Millennium dancing! I’m not the greatest organist, far from it, but this is a hymn that I feel like I can do a lot to raise the temperature as the singing progresses towards the white hot fire at the throne in the 4th verse when “every tongue sounds praise to [Him]. It’s my version of adding some Fire Whiskey to the Strawberry Punch. The 1st time through I play everything as written except for one chord that I always re-voice. I don’t like the ambiguity of the chord on “now” in the last line. E-G in both hands. That’s pretty noncommittal. I’m sure the composer was trying to avoid illegal parallels. I always play that chord with a C in it. Bar 8, alternate option 1. Bar 8, alternate option 2. Bar 10 gets a little more exciting. The I’ll add this 1st inversion D chord on the 2nd or 3rd time (alternation options 1). On the last verse, with a bigger registration, I like to juice up this bar a lot. See the full final verse below. Bar 10, alternate option 1. See option 2 below in the big ‘final verse’ example. Bar 12, alternate option 1. Bar 12, alternate option 2. By the 4th verse I’m well oiled, and I hope the congregation is too. They usually are. They seem to catch on and join the party. I go a little wild and add some slightly crunchy and definitely more robust harmonies. Here’s what I did a few weeks ago when we sang this hymn in my ward. Bars 10 and 14 are my favorite bits. Dr. Pew’s 4th verse ‘Fire Whiskey’ alternate organ part. What a fun hymn. I can’t imagine this one would be cut. It’s too great and wonderfully rousing. That’s all for today. Tune in tomorrow for some battle scars. P.S. If you haven’t yet, feel free to click below and subscribe to these posts. I’ll send you a short email every time I post. And feel free to tell your friends, especially if you have an organ playing friend who could use some help. Jason’s registration suggestions are super helpful. Thanks! 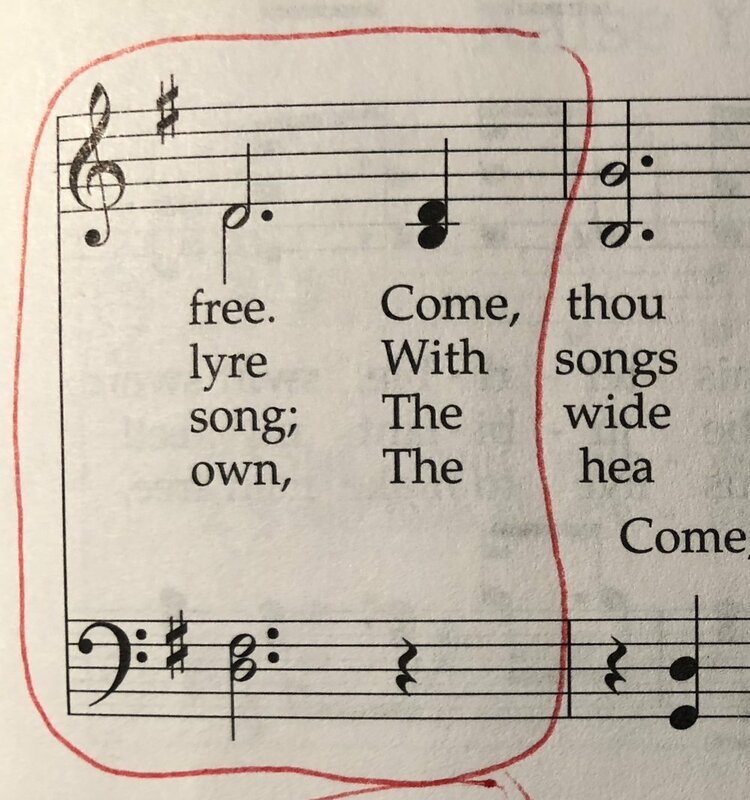 The second hymn in a row on the most-highly-desired well-known hymns list, I find this hymn more worthy of this position than the previous hymn. 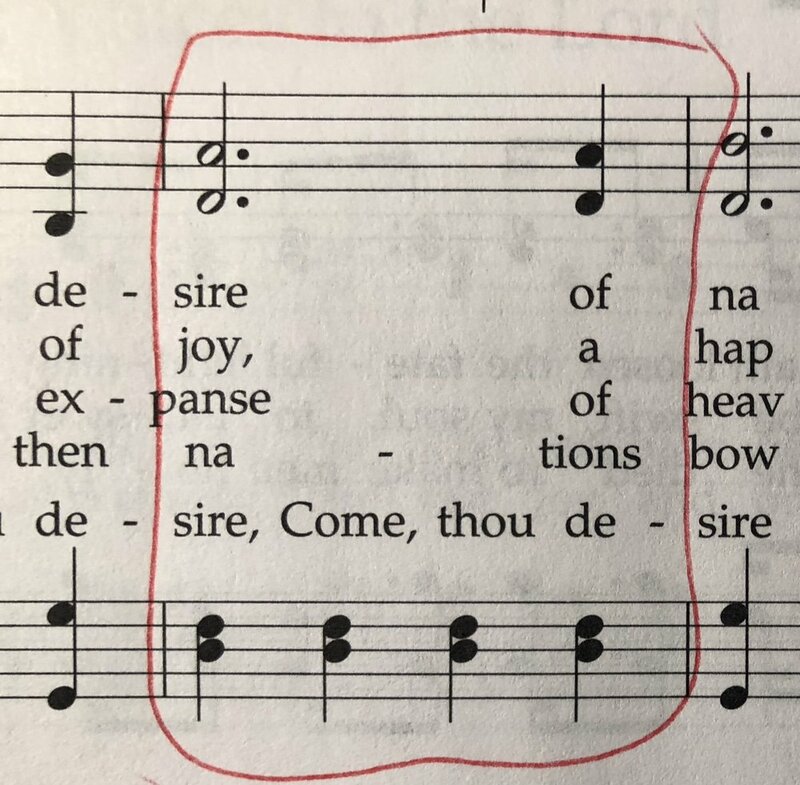 While I am not wild about the men singing a different line in the third line of the hymn, the exceedingly strong melody coupled with a tremendous text work to overcome the (I don’t want to say deficient, but I definitely don’t prefer that harmonization, so weakness?) of the third line. May I also commend to the organist’s learning a fabulous arrangement on this hymn by Douglas Bush. I find it useful at my job at an Episcopal Church in addition to it making a great postlude or “special” music number in Sacrament Meeting. Based on my complaints of the editing of our hymnal in previous posts, I find this observation by Karen Davidson somewhat contradictory to the editorial practice employed by the committee. She observes that “a welcome change in the 1985 hymnal is the inclusion of verses three and four within the music staff. In the 1950 edition, the last two verses of this favorite hymn were printed at the bottom of the page and were rarely sung. Now it is more likely that all four verses--the complete message of the hymn--will be sung.” Holy smokes! This should have been the practice for all hymns, and I hope it is for the next hymnal. Repeating this comment, the Hymnal 1982 prints all seven verses of “All Creatures of Our God and King” within the staff. It can be done! Like the previous hymn, this hymn is best played by conceiving the pulse in two. It gives a proper lilt and forward propulsion to the hymn. It is very dangerous to plod along at too slow a tempo, especially with a hymn like this. Taken too slow, it loses the power and drive that the text demands. Half note equal to 54-56 beats per minute is a nice, bold, stately tempo. This hymn also calls for a strong plenum, employing 16’ reeds and a trumpet for the final verse.